Albert Brumley is probably the best-known 20th century gospel music writer in America. He wrote his first and most successful gospel song in 1931—"I'll Fly Away." Although listed in "The Complete Million Dollar Session" and other Million Dollar Quartet releases as "Blessed Jesus (Hold My Hand)," Brumley' actually wrote this hymn as "Jesus, Hold My Hand" in 1933. The Prairie Ramblers seem to have recorded the number first and this on 15 August 1935. The recording was released on Columbia 20209, Conqueror 8726, Melotone 6-11-70, and Vocalion 03115. 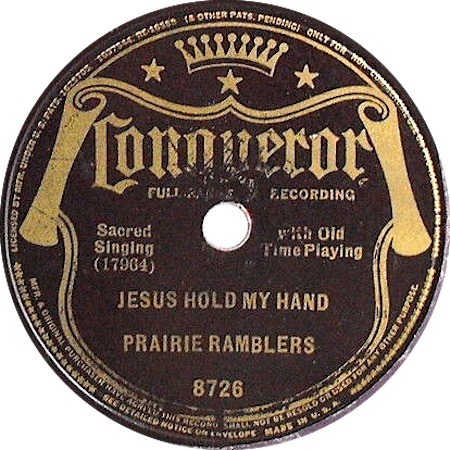 Confusingly, the Ramblers' release is often referred to as "Let Jesus Hold My Hand." Another candidate for original recording goes to the Royal Quartette, that perhaps recorded the song one week earlier, on 8 August 1935, for release on Decca 5130. However, I have been unable to locate this release.